It seems like only yesterday that we got Game Boy Advance games on the Wii U Virtual Console, but now DS games have also joined the party. 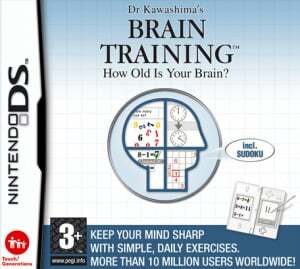 Curiously enough, Nintendo has chosen not to start off with one of their classic franchises, like Mario or Zelda, but has instead opted to go with one of their best-selling titles, the original Brain Training (Brain Age for those in North America). Even more surprising is the fact that the title has launched for the stunning price of absolutely nothing — though it's important to stress that this won't last forever. As you might be aware, Brain Training is not really what you would call a traditional videogame, but rather a collection of small tests to keep your mind sharp and your reactions quick, which arguably helps you when playing other games. 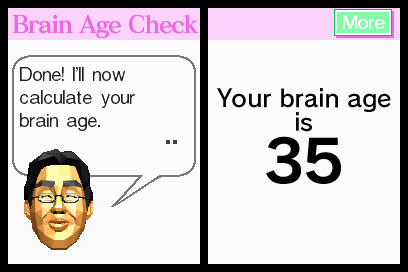 The main mode for doing this is the Daily Training (AKA Brain Age Check), which the game recommends you to play once every day. This gives you three random tests in a row and, depending on your performance, will give you the estimated "age" of your brain. Naturally, the goal is to get that age lower by getting better and better at the test. 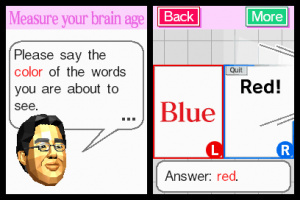 Now, the Nintendo experts will be quick to point out that Brain Training was one of the few DS games that used the "book mode" during gameplay. Instead of holding the DS upright, with both screens above each other, like for most games, you instead flipped it sideways, which, like its name implies, made it somewhat resemble a book. The game still essentially works the same way, although now the screens are simply displayed next to each other on the GamePad, neatly covering the whole screen. When you've done your Daily Training, you can also check out the Quick Play mode, where you can play nine short tests on their own. Although you might expect otherwise, these tests are — with the exception of one — not actually the same as those that appear during the Daily Training, although they are mostly similar in theme. These range from rapid-fire calculations to reading tests, where you're tasked with reading a block of text out loud as quickly and error-free as possible. Not all of these are immediately available however, you'll have to keep doing Brain Age Checks to get all of them. 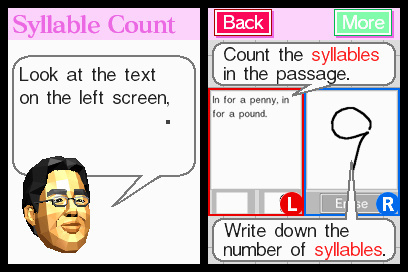 With a few exceptions, almost all of the tests make use of the DS (And now the Wii U's) touch screen and microphone, requiring you to draw numbers or read out words, for example. Unfortunately, this was a relatively early DS title, so the recognition is not exactly perfect — numbers have to be drawn very precisely and words have to be pronounced very cleanly, or the game will fail to recognize them and ask you to try again. This can cause annoying moments where you know you're doing things right, yet the game will reject your answers, eating up precious time and lowering your score for a completely unfair reason. The voice tests are especially aggravating for people who don't speak English as their native language, as even the slightest accent can throw the game off. Luckily, tests that require speech during the Daily Training can be completely skipped if you so desire. Although it seems like more of a bonus, another meaty section of the game is a Sudoku mode, where you can pick one of a number of Sudoku puzzles to try and solve. It's not really a training exercise, but your best time for each puzzle will be saved, should you ever get the urge to try it again. The amount of puzzles is somewhat limited compared to the multitude of Sudoku games available as downloads on Nintendo platforms, but there's still enough to keep you entertained for a while. Stylistically the game is rather simple, with very basic-looking menus and tests, and mostly rather short pieces of music. Of course, this fits perfectly with the type of game it is, so it ends up working quite well. 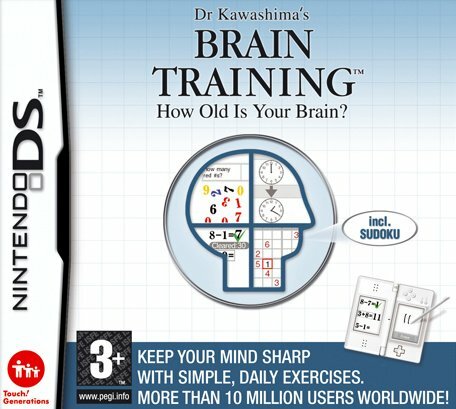 Upon its original release, Brain Training became massively popular, selling millions of copies and getting tons of people to buy a DS for the sole prospect of brain exercises. Nowadays there are plenty of similar titles available, so it's somewhat hard to see what made this so special. When it doesn't decide to screw you over with its lack of writing and speech recognition skills, it's a fairly capable game to waste a few minutes per day on, but there is no denying that its sequels improved upon the formula. It's free so I can't complain. I wish there's an option to split the screen on the TV and gamepad. Or rotate vertically holding the gamepad vertically. Also clicking the right analog stick will rotate the screen 180 degrees which I read from a NL comment. PacLand review please before the promo ends. I'd say the game hasn't aged well at all. However, it still serves it's purpose well, even today. Can't complain with it being free either. when the NA version coming out? I noticed/thought about one thing while I played this...how are 99% of the other games supposed to work with the gamepad!? I really don't understand why people think Nintendo would make you hold the gamepad vertically to play DS games. It's pretty obvious that this set up is only for vertical DS games, like this one. @Tsurii897 I imagine that Nintendo's method of presenting DS games will vary depending on individual titles; Metroid Prime Hunters would require your TV for the top screen and the gamepad for the bottom screen and its stylus controls, whereas Mario Kart DS could allow you to swap the screens around at a click of a button because you can perform most actions without touch controls and once you're in a race the only thing you'd be missing playing off-TV is the map. 6 for a free game with no in app sales seriously now. It doesn't like my 8s at all. I think they look great. Hates my nines. I pretty much gave up. This game is good if it doesn't come to writing letters and speak up something. I cant write them more clearly and it took them for another ones. And they can't be deleted per one, only all 4 at once. Really hard to write down seen words. If you make an upgrade... it would be great. I think this game is pretty good on WiiU. I have only a doubt regarding the "download" section. Yeah because it is possible to flip the screen upside down so you can hold the gamepad upside down. It makes so much sense. In my opinion this was way better than its sequel. It is worth picking up just for the Sudoku puzzles for me. Past that there was little about the title I cared for. I find little to agree about here. It's a major classic in my eyes. one question. where is the mic on the wii u gamepad? @xj0462 To the left of the Home button. My brain is 95 lol so i deleted this game. 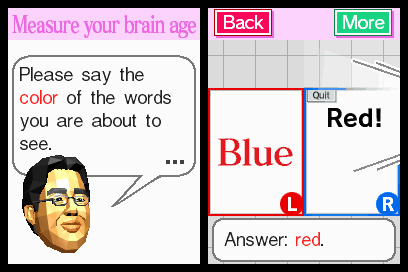 I fall in that category where Brain Age was the reason I bought a DS Lite back in the day (that, and the portable system of choice in college was the DS). It did stagnate about a month or so after unlocking everything (at which point, I moved on to other Touch Generations titles), but it was still a great title. Earning "Rocket Speed" on Calculations x20 gives one an immense feeling of self-satisfaction. If this is going to be the quality of the DS games I won't be getting any. (Even then I have just bought a DSi XL and have most of the DS games I want). The GBA stuff is of a good standard. NoA doesn't want to release this beause it's average? Oh my. I used to own this game on DS but sold it just a couple weeks ago. Hah, I'm getting the value back This game is actually pretty fun for a while, on summer holidays I won't be using my brain at all lol so I might as well play this. It never seems to recognize when I say "blue" aloud though... jeez, my accent isn't THAT bad?? I'm really grateful they gave this away for free, it is one of the few titles on the DS I completely missed somehow and is actually quite enjoyable in small bursts. Sadly I have an asian accent so it doesn't recognise my speech (so I can relate to that part of the review). I had no problem with it detecting my handwriting though. It may sound dumb, but for me the best part is the sudoku's. A pity that you can't download new ones, since the download option doesn't work (as I expected). I still wonder what will happen after 13 July. I do hope I can keep the game for free, though I am not sure! Well, at least this shows that "book" DS games work on a Wii u Gamepad. If only the game recognized my handwriting! when the F*CKING HELL is this coming to america! ?